It may not feel like Spring where you are, but here in Los Angeles many of us are scratching our heads asking where is this wet, cold weather we were all told was coming. But in just a few weeks it will be Spring, so everyone’s new cocktail menus are going to start rolling out around town. (In fact, they’ve already started and you can peep a few like these above ^^^) Keep your eyes tuned to the Stir and Strain Instagram and Snapchat for the next few weeks as we test drive some menus here (and beyond!). For all of my non-US readers, if you’ll allow me a moment to indulge in a little red, white, and blue bar cart accessorizing I’d super appreciate it. And while together it’s a Patriotic Bar Cart fiesta, taken piece by piece they could work in your home too. In a little less than a week, my neighborhood will be filled with illegal fireworks, barking dogs and the inescapable wafting aromas of food being grilled. It will also be filled with drinking galore. For those of you outside the city of Los Angeles, I’m sure you picture every day here like this (sometimes I’d agree with you), but next Friday in particular the country bands together to show our love of hotdogs and beer (and maybe something to do with history but you can turn on C-Span for that). 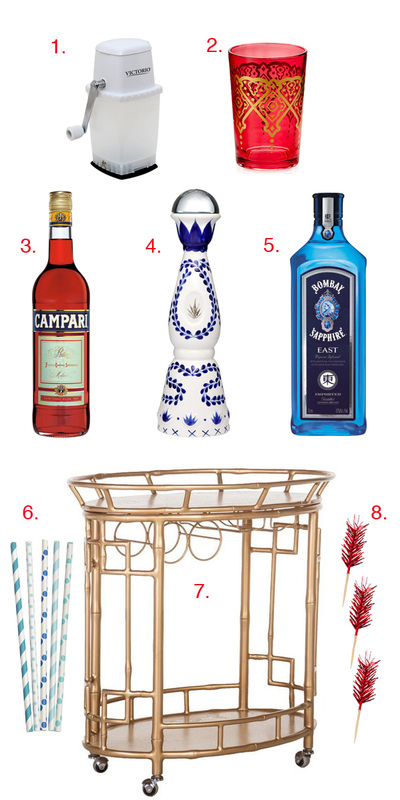 For those of you hosting a party, here’s a little guide to up your bar cart game for the 4th. Buckets of crushed ice, colorful drink accouterments, and some fine liquor selections. Now go get some sparklers and confetti poppers! Springtime! A reason for garden parties and gathering outdoors (both of which I need MORE of in my life). Where cocktails flow from giant bowls and ladles, all laced with bits of fruit and maybe a flower or two… Excuse my fanciful daydreaming for a moment. I’ve been nose-deep in another Jeeves and Wooster novel this week and the English Countryside is calling my name. It’s also calling for the procurement of another punch bowl set in my house. These punch bowls have caught my eye recently and perhaps they’ll pique your interest too. What’s a home bar without at least ONE fanciful punch bowl? Undignified; that’s what. Ok, maybe not that but take a look. 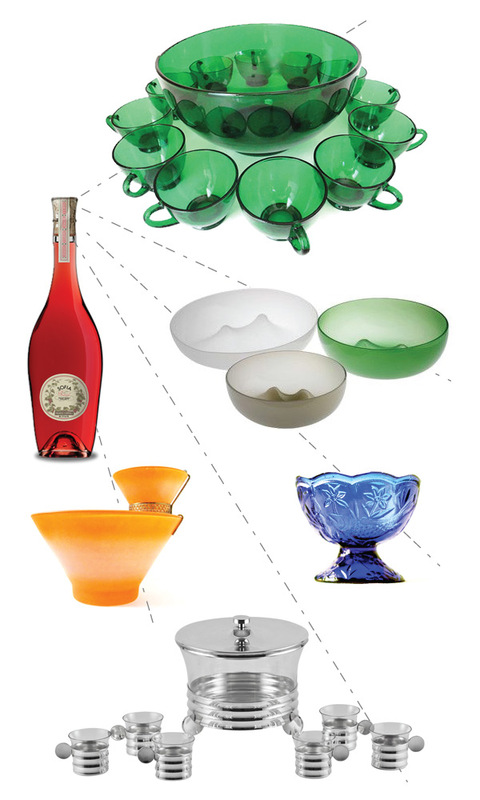 Holiday Gift Guide: Cocktails. On a Boat. Probably every year about this time I start feeling uneasy and mumble to myself, “I’m not ready yet”. Purity jokes aside, it usually means I’m all a fuss about the upcoming holiday season. I mean, it’s 80 outside. It sure doesn’t feel like Santa is hiding in my chimney, ready to come down and scold me for not baking enough cookies this year. But just because I’m a bumbling mess doesn’t mean YOU have to be. This year I’m trying to be more proactive and bring you, readers, timely gift guides. Not like those I threw out in March, even though, well, St. Patrick’s Day is also a relative holiday in my field. Today we’re going to ease into just thinking about fun gifts for those cocktail lovers/enthusiasts/entertainers in your life. Or you can make a list for yourself! Who cares?! I don’t; you should see my “to buy” list, many items of which will actually be appearing here in the next few weeks. 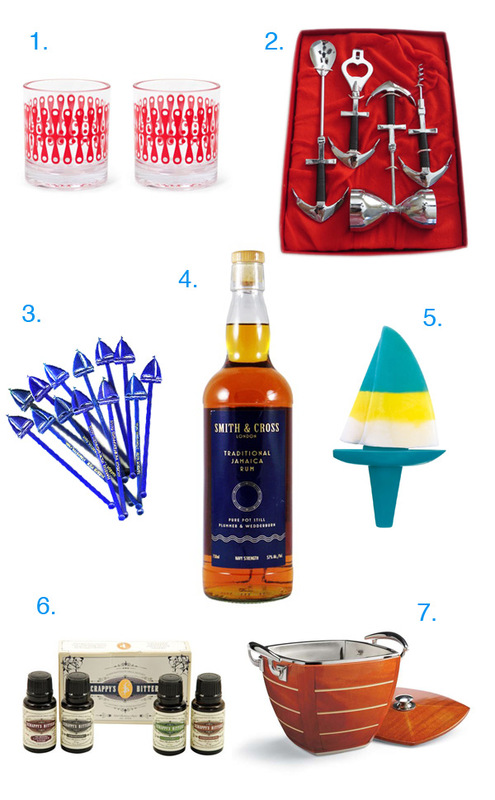 Since it is still pretty balmy out here in Southern California, I’m taking you on a boat trip – with boozy gifts. You’ll need a good Navy Strength Rum on this boat, and a couple of shatter-resistant glasses (for when it gets rough). Who wants to carry a bunch of full size products when you can have mini bitters on board? Adult ice pops? Yes. Just don’t forget the ice bucket!